If you would like to search for health insurance right now, all you need to do is fill in your zip code below and you will be able to compare health insurance quotes for a variety of companies in your area. In 2003, the Good Samaritan opened an office in Gwinnett, Georgia and in 2006, an office opened in Cobb, Georgia. The Good Samaritan Health Centers provide a variety of services for those in need. They provide medical services, dental services, mental health counseling, health education, and social services. The mental health services are available for children, adults, families, and individuals. As part of his or her overall health assessment, the mental health of each patient is addressed. As part of health education, Good Samaritan offers nutrition counseling and education about health conditions such as diabetes and asthma. The education is offered in-group settings as well as one-on-one. In regards to social services, there is contact information available through the Good Samaritan Health Centers for a variety of social services agencies. In addition, a caseworker for Medicaid is available to decide if one is eligible for programs sponsored by the state. As a nonprofit organization, the Good Samaritan Health Centers depend on businesses, individuals, churches, community groups, and foundations to contribute to their centers. Only 25% of their operating budget of $2.6 million is covered by the fees paid by patients. There is a variety of ways to support the health centers. You can send monetary gifts to the Atlanta office or with a credit card online. If you work for a company, you can make the health centers a recipient of gift matching. You can also purchase stock gifts such as their music CDs or donate a gift-in-kind. You can also give a gift as a memorial or in someone’s honor. Volunteering is another great way to support the centers. Without volunteers, the sliding fee scale would not be able to be offered by Good Samaritan. The front office and business assistants support staff, interpreters, and healthcare professionals all volunteer their time and work. There are opportunities for volunteering throughout the year. Openings for health professionals and Portuguese and Spanish interpreters are especially needed in all of the health center locations. Dental and medical professionals receive one hour of continuing education for every four hours of working as a volunteer. 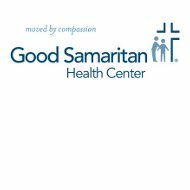 Contact the Good Samaritan Health Centers to see what other volunteer opportunities are available and when the volunteer orientations will be taking place. Enter your zip code in the space provided below and you will be able to compare health insurance rates for a number of different companies in your local area. Inquiring about one, for dental and vision.